So many photos that I wanted to post today. Yet, it seems that Blogger isn't liking me too much. I'll have to post the photos from Mia's 1st birthday later. Anyhow, I'm off to talk to CCSN. I'll explain the hows and whys of that later also. Maybe, I'll try one more time to get a photo in there. Oh sure, now it works hours after my first attempt as I'm getting ready to leave for work. Mia really enjoyed her birthday cupcake. She ate all the icing and the cake itself wound up on her and the tray in front of her. 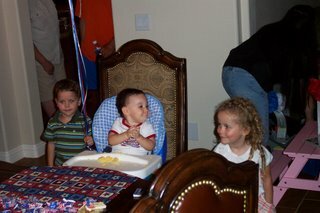 I think Connor and Olivia liked watching someone else make a mess. 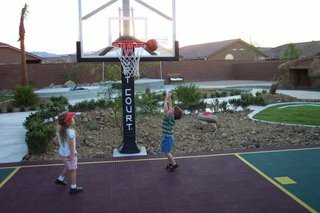 The other photo here is of Connor and Olivia playing basketball. We lowered the hoop extremely for them and they both made shots. I even got a few photos of their dad lifting them over the rim so they can dunk the ball. I guess you have to take those photos now or they'll be too big to lift. Instead of putting one of those photos in, I'm opting for a photo of Lillian with my sister Michelle. That way we have photos of all of them here. Ok, now that this is working... I'm going to be late heading to CCSN but I can do that tomorrow. 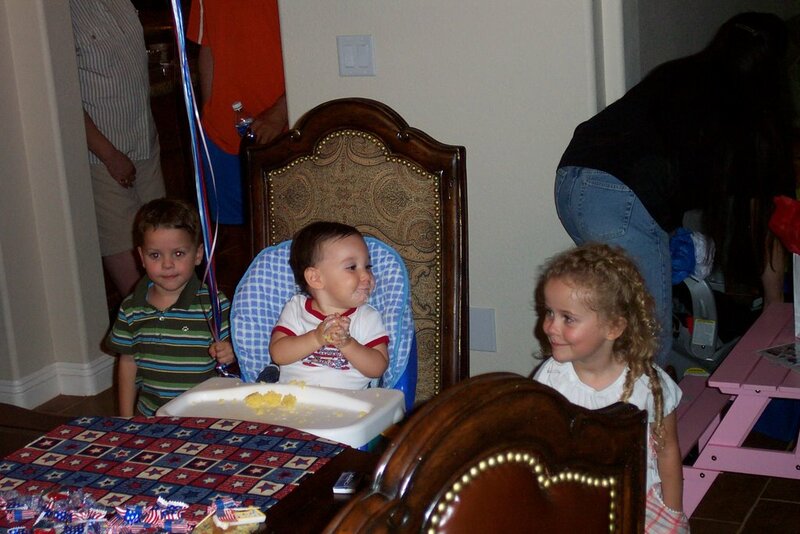 All four of these little munchkins are adorable! Your sis has gorgeous hair! Love the pictures! Those are some great looking kids. Looking forward to hearing about this CCSN adventure, or misadventure? I am still in shock that she is a year already. Wow! Times does go by very quickly.